Being woken at 5am by my two year old, Alice, after a late night travelling between France and England in the 1400’s, isn’t easy (though, thanks Philippa Gregory for the escapism). I lay on the sofa, trying to sleep, hoping the ‘Peppa Pig‘ DVD would suffice to keep Alice from demanding too much attention. By 7.30am my oldest daughter, Charlotte, was awake. Within ten minutes of waking it was clear that anything anyone said or did would provoke a mega-watt reaction. She was exhausted and in the dreaded ‘lizard brain’ mindset, unable to see any clarity or sense, filled with fiery rage. We decided her mental health would be served well with a day at home. She tucked up to watch an old favourite, ‘Finding Nemo‘. My middle daughter, Sophie, woke close to 9.00am, sensibly catching up on sleep after her late night (she’s been a bit of a night owl lately and, as a homeschooler, relatively free to go with her own natural bio-rhythms). She was in top form. 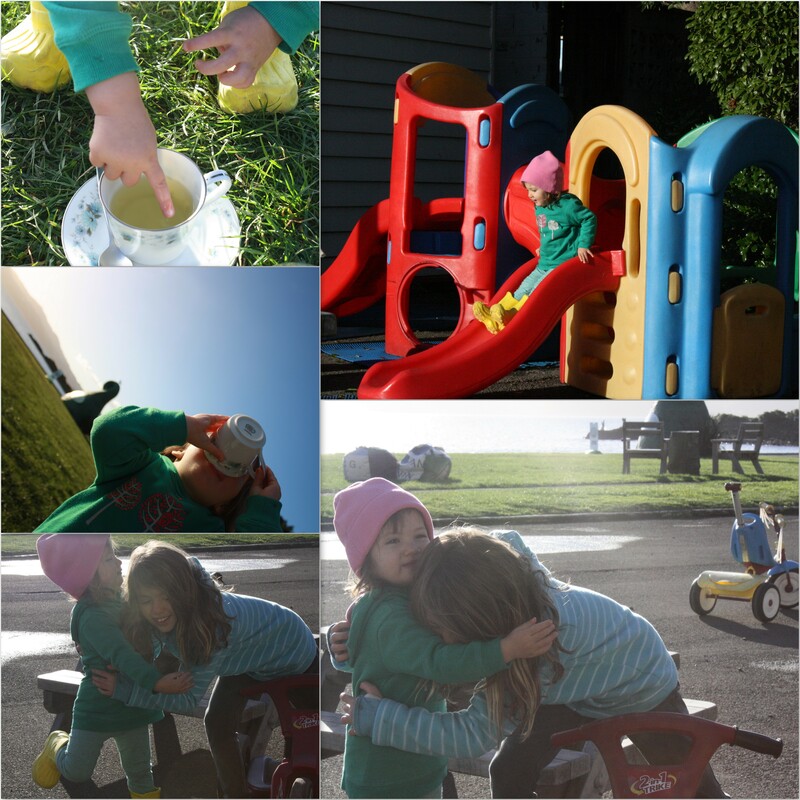 We were supposed to meet up with some home-school friends for a swim – but with Charlotte home and Alice up so early, it wasn’t to be. By 10.30am I was ready for a nap – and so was Alice. She fell asleep on top of me, whilst I was reading a book in the play-room. We stayed asleep… till the afternoon! 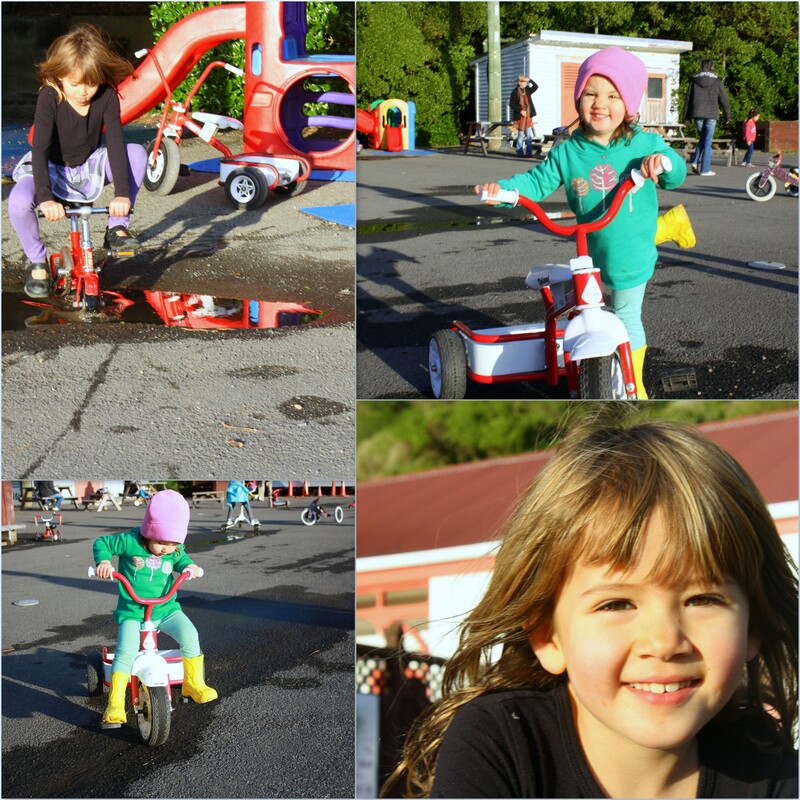 Charlotte and Sophie were so good – keeping themselves quietly entertained, fed and watered. I couldn’t believe the time when I emerged from a sleepy slumber with Alice. It was 2.15pm! The sky was blue, the wind a gentle whisper (yes, it can be gentle in Welly!). There was no way I was going to let us waste the last few hours of daylight indoors. 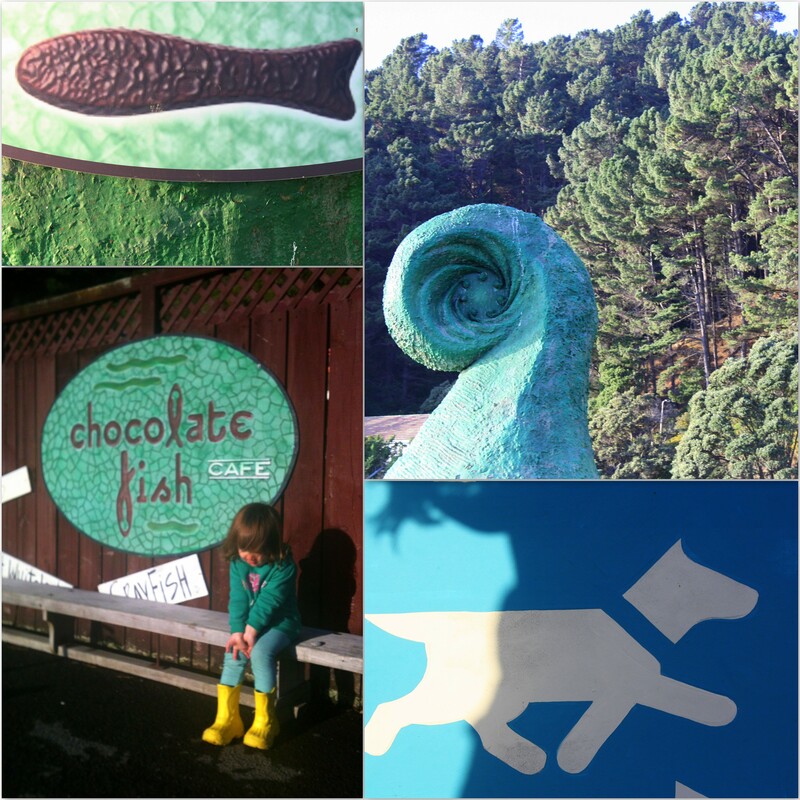 By 2.30pm we were out the door and bathing in the afternoon rays and fresh air at The Chocolate Fish in Shelly Bay. A late lunch of soup, bagels and bacon butties (served with a chocolate fish – naturally), went down a treat. 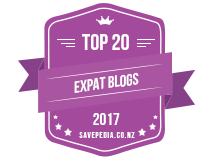 I felt pepped up after a latte and moved onto a green tea – lounging on the bean bags, enjoying the sight of the sun, slowly sinking in the sky, over the city of Wellington, in the distance across the bay. My daughters ran about, playing ‘museum statutes’, racing on the ride-ons and climbing aboard the model ‘Interislander’ ferry for a pirate adventure. Alice proved to be a little green tea leaf – testing my tea with her fingers and then draining the contents as they cooled. I half watched and half interacted with their play – loving the rarity of seeing them all connect on top form. After a while the play started to move away from the cafe, as the setting sun pulled the girls closer to the shoreline. We headed to one of the many little beaches that dot the Miramar Peninsula. A beach strewn with nature toys of smooth stones to skip on the calm waters of Evan’s Bay; shells of various sizes, colours and states of erosion; smoothed glass of green, yellow, orange and white; and large pebbles for tossing into the water with a satisfying splash. 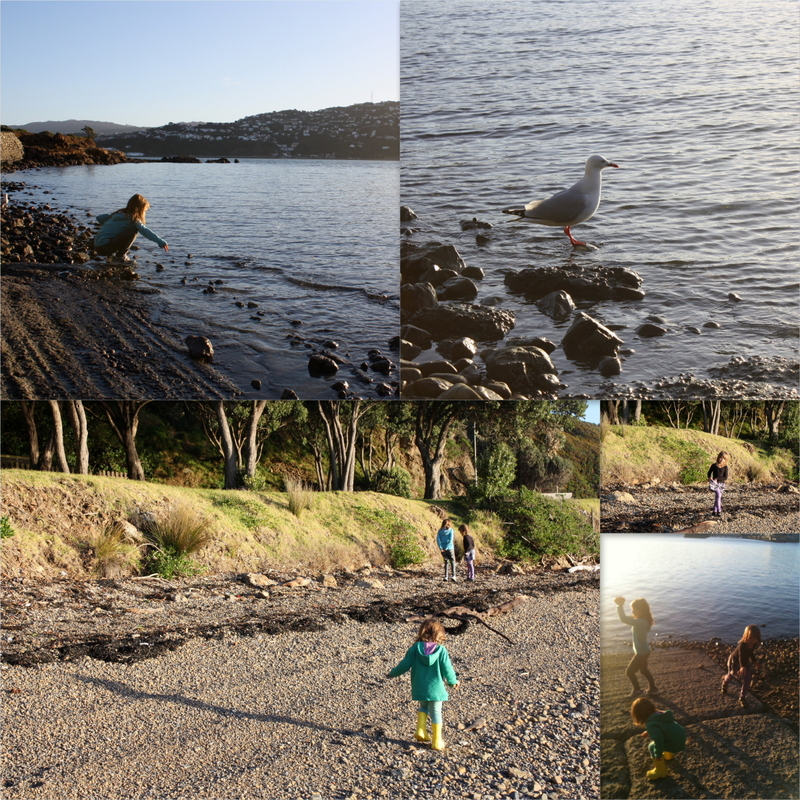 My older girls searched for rocks they could tap away at, in the hope of revealing hidden gems or fossils. It was beautiful to play with my youngest, Alice, whilst watching Charlotte and Sophie interact. Two sisters, sharing discoveries. This school term has felt long and I’m relieved that Charlotte, my oldest – who turns 9 on Thursday, will break up on Friday for three weeks of ‘down time’ to simply ‘be’ over the holidays. As the sun set and the warmth of its glow left us, we retreated to the car to head home. But before we did, Charlotte stopped a moment to sit and reflect at the beautiful scene. Sophie joined her – and then Alice. It was a special moment of peace between the three of them. A moment of solidarity. A moment I had to capture and hold onto in my heart. 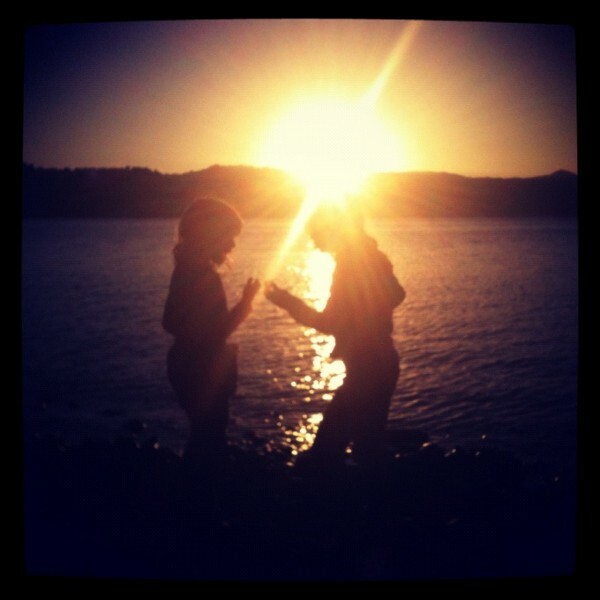 They gazed at the new moon, but a crescent of light high in the sky, and the final glow of the sun over the city hills. I feel so blessed to have three special daughters in my life (however much they exhaust me and test my nerves at times!). This is what it’s all about. 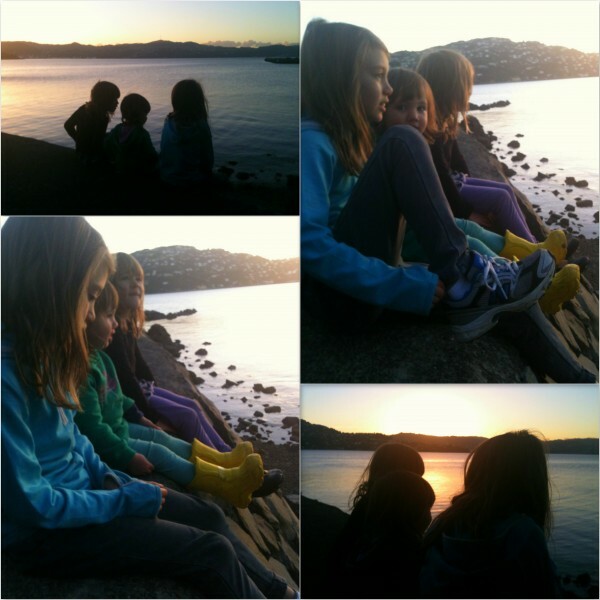 This was one perfect Monday afternoon of three sisters in harmony, enjoying some fresh air and winter rays at The Chocolate Fish in Shelly Bay. Alice, Charlotte, Sarah, Sophie chocolate fish cafe, Love where you live, Miramar, Shelly Bay, sisters, Wellington. permalink.